Classroom Freebies Too: Creative Library Freebie! I realized recently that I had loaned a book to a colleague and it still has not yet been returned! I decided to find an easy solution to keep tabs on it. 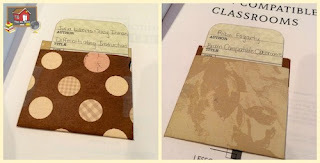 How about some old school book jacket envelopes and checkout cards? This idea is just a little something nostalgic for those items that may not to be “checked out” often, yet it still contains an accountability piece so that you will never lose track of where your item might be off to in the coming weeks and months. Want your own free library card templates?